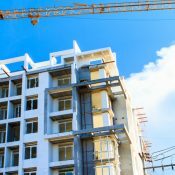 The prime leasing season for the U.S. apartment market has passed, and performance is expected to slow with demand through the tail end of the year. 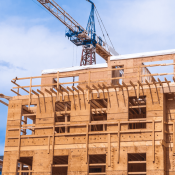 A strong prime leasing season, however, has the market in solid shape heading into the seasonal slowdown, with many markets picking up rent growth momentum over previous years. 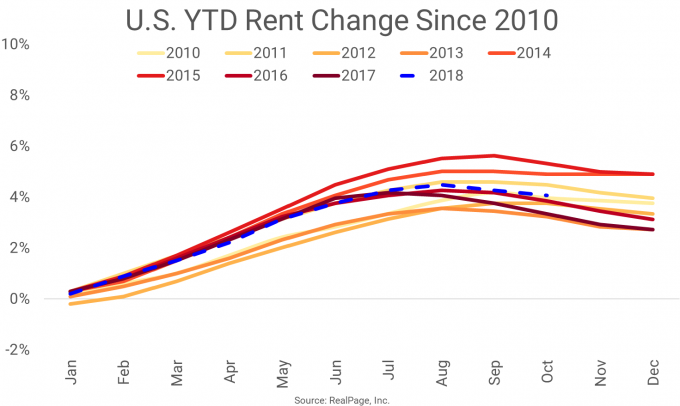 To gain some perspective on momentum in the marketplace, let’s look at year-to-date rent growth as of October. 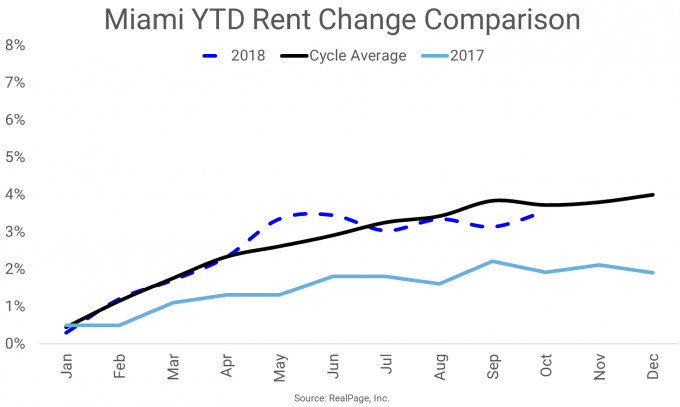 Year-to-date rent change is simply calculated from taking the current month’s rent and comparing that rate to the previous December rent. 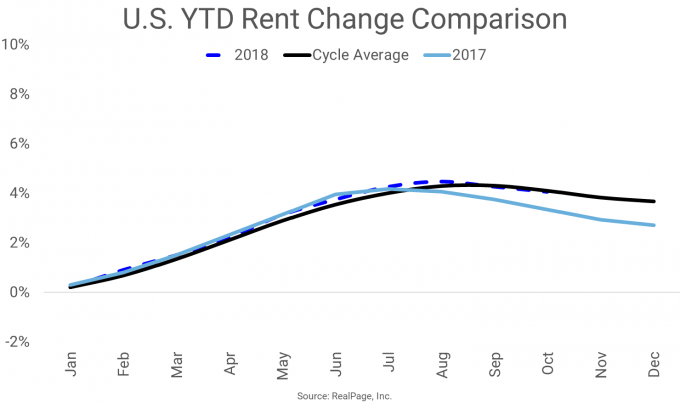 For the U.S. overall, graphing year-to-date rent change in each year of the current cycle illustrates the normal seasonal pattern in October, November and December, when the apartment market almost always gives back some of the momentum gained in the peak summer months. We can also gain insight by looking at the cycle average figure versus current year-to-date performance. The black line below takes the average of each of the past eight years, allowing for a clearer view. As illustrated in the chart above, 2018’s year-to-date growth has mirrored the market’s cycle average pretty closely. But compared to 2017, performance looks even better, reflecting the recent momentum the marketplace has seen. In other words, some of 2017’s weaker months are being replaced by a stronger August, September and October in 2018. 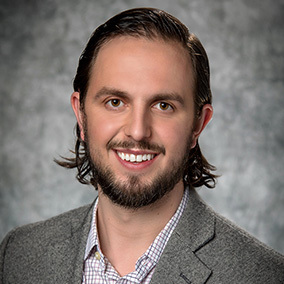 While the U.S. overall has seen some performance improvement, two local markets in particular have seen especially solid momentum gained in 2018 – Austin and Las Vegas. Austin was among a handful of local markets to see rent momentum essentially stall in 2017. 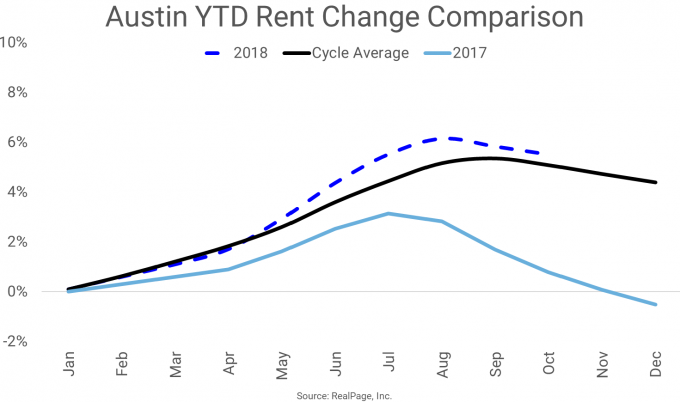 In fact, Austin’s 2017 performance was poor enough that effective monthly rent in December 2017 was actually lower than that of December 2016. 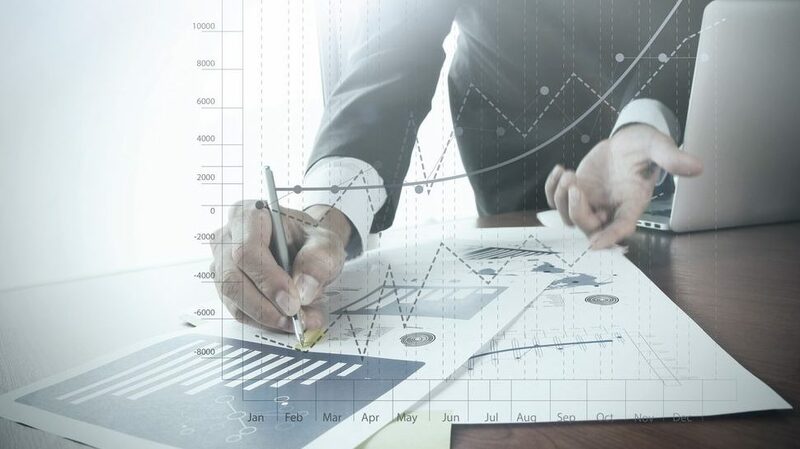 But to date in 2018, not only has performance been positive, but growth has actually outpaced the market’s cycle average. 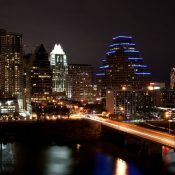 The outcome has resulted in Austin moving out of the ranks of the poorest-performing markets in terms of rent growth. 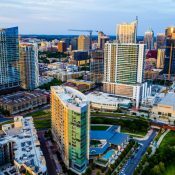 In October 2018, Austin’s annual growth rate (4.1%) ranked 12 out of the nation’s top 50 markets. 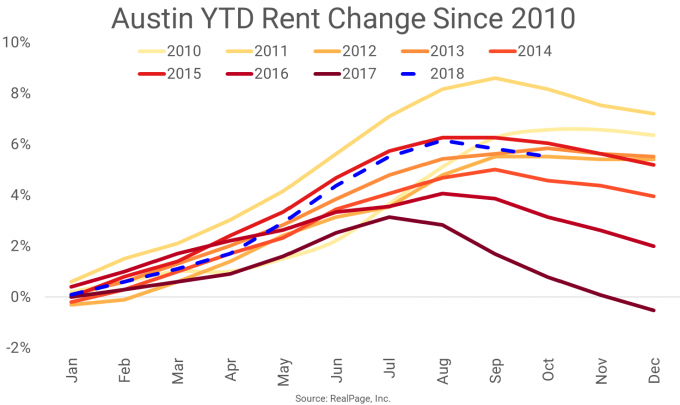 And while that alone may not seem incredible, consider that Austin was actually cutting rents on an annual basis as recently as March 2018, which ranked as the nation’s worst performance at the time. 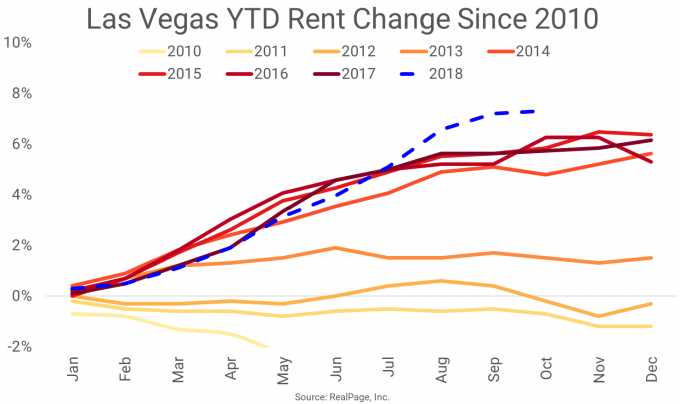 Meanwhile, Las Vegas hasn’t seen such a turnaround as abrupt as Austin’s, but recent momentum in Nevada market is impressive. Las Vegas exemplifies the late-recovery story perhaps better than any single market in the nation. While performance was recovering across most the nation by late 2010 and into 2011, the impacts of the housing bubble were impacting Las Vegas well into 2012. While many other markets appear to have already peaked, Las Vegas is just now hitting its highest level of performance this cycle. The cycle average is obviously watered down by three weak years at the start of the cycle, but the two blue lines in the chart below show that momentum has clearly returned in a big way. 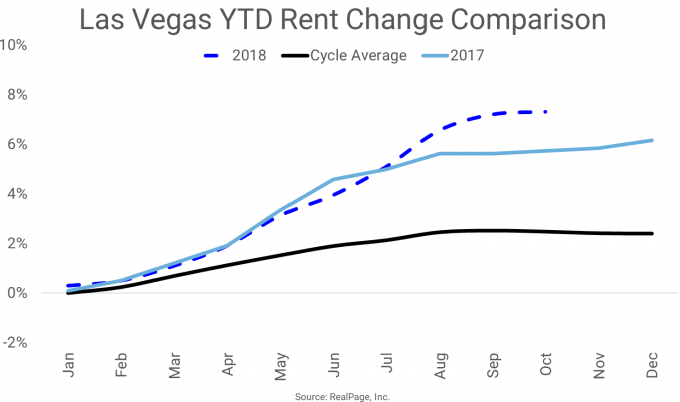 As a result of this phenomenal year-to-date performance, Las Vegas is the nation’s leader in terms of annual rent growth in October 2018 at 7.3%. While Austin and Las Vegas have picked up steam, there are, of course, some markets that are experiencing softer performance. Houston exemplifies that trend quite well. There is a lot of information to unpack for Houston’s trend. In late August 2017, local performance completed an about-face from the prior year as shown in the year-to-date graph below. 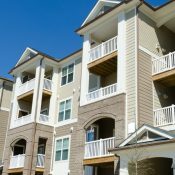 That improvement was largely due to the effects of Hurricane Harvey, when numerous Houston residents displaced by massive flooding turned to apartments for temporary housing. Year-to-date performance in 2016 bottomed out at -2.5%, and 2017 started soft relative to the market’s cycle average. But in last four months of 2018, year-to-date performance jumped as high as 4.3%. 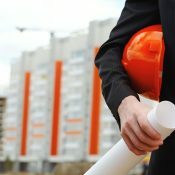 As a result of this drastic change, annual growth through the early part of this year appeared solid, as the weaker 2016 months were being cut out of the annual calculation and replaced in the annual rent change calculations by the stronger 2017 months. 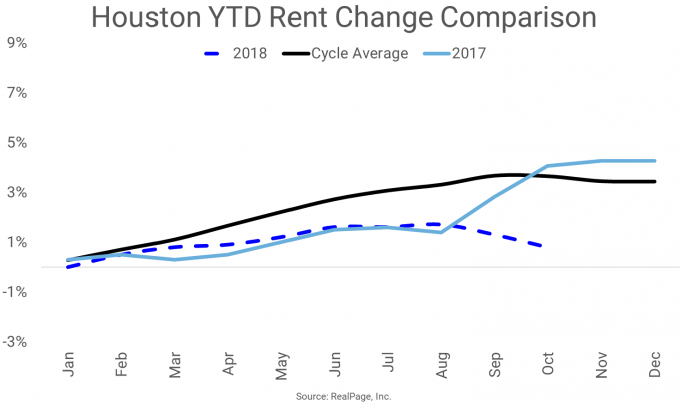 However, as the post-Harvey effect has burned off, performance in 2018 has struggled to rebound to cycle average levels. 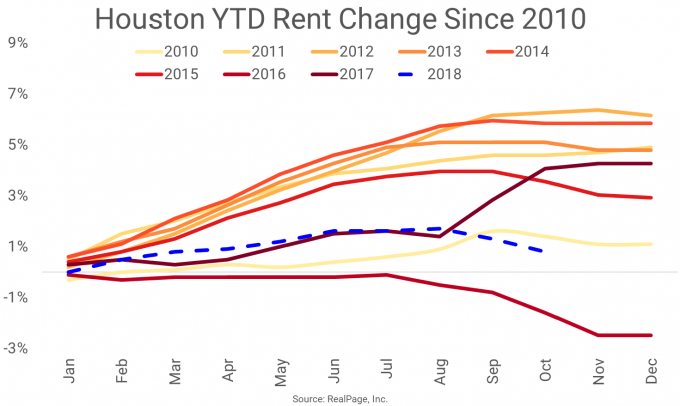 And more recently, the slowing momentum from August to October has Houston’s annual growth numbers positioned for somewhat of a slowdown relative to one year prior. Hurricane Harvey disrupted performance in Houston, resulting in the market breaking from normal seasonal patterns in 2017. However, some markets, like Miami, have unique characteristics that prevent a seasonal slowdown at the end of the most years. 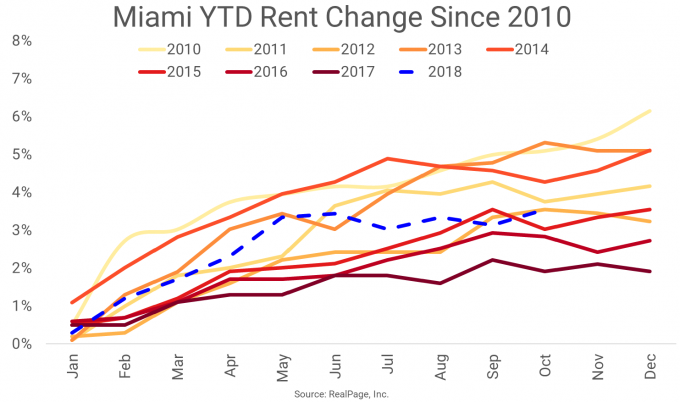 Miami is one of the nation’s few markets that actually sees an increase in demand during the last quarter. As such, Miami tends to get a bit of a lift – or at least stabilize – during the tail end of the year. The reason for Miami’s unusual trend? The market has a wave of residents that relocate from colder markets in the northern part of the nation. A similar – and at times even more pronounced – trend is typically seen in many of the southern Florida markets.